Adventure is extensively used as a teaching tool throughout the Bible. 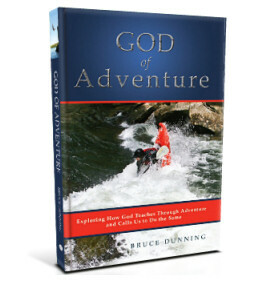 In God of Adventure Bruce Dunning proposes 19 principles from the Bible that outline the validity, core concepts, and teaching approaches of what is called Christian adventure learning. Bruce Dunning has been the Executive Director of Medeba Adventure Learning Centre for over three decades. Medeba is located in West Guilford, Ontario, Canada and specializes in Christian adventure learning. Its mission is to use adventure and community to challenge young people to continually say “yes” to God.